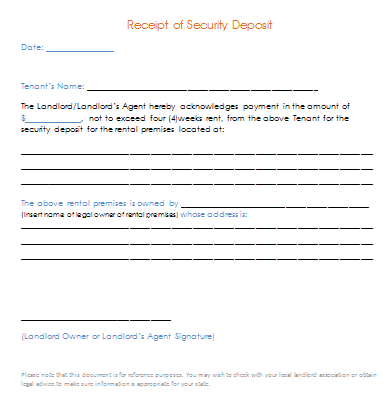 Security deposit receipt template is a simple form that can be used by landlords in ensuring all tenants in an apartment have paid for security. The Security Deposit Receipt Template can also be used by the security company to issue landlords as receipts for completed payment on security. Tenants can be issued with the Security Deposit Receipt by landlords to show the tenant is clear off any security deposit arrears. Tenants should always ask for the security deposit receipt because it’s always advisable to get it after handing over cash to the landlord. Rent is tax deductible in some areas and this receipt to get tax discounts and it also forms part of property management to the landlord. These instant print security deposit receipt templates are usually designed in word and can be easily customized to suit your wants before giving it to your clients or customer. Before using the security deposit receipt template, it is wise for the landlord to check with the local real estate laws if the receipts format is correct. Security deposit receipt templates are designed in word and can be easily customized to add some information that is not contained in the template. 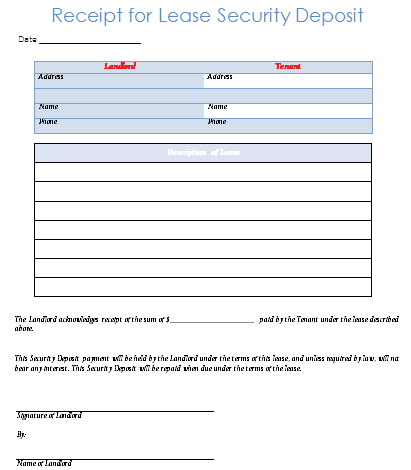 A normal security deposit receipt template includes the date issued and the security deposit receipt template number on the top, then the sum received, the tenants name, the premises location, indicate if the money was paid in cash, and if by check or money order indicate the number. At the end of the security deposit receipt template, there is the part where the landlord signs and includes his name and address. When a tenant has not paid up all rent and promises to pay later, should also be included in the template and it should show the outstanding balance and when it will be paid. Knowledge is power and now you know how to go about with the security deposit templates to issue to your tenants for their peace of mind for you to keep the records.